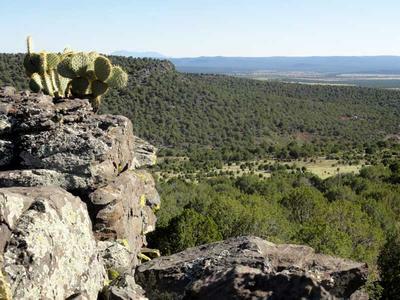 The Ash Fork Hill RV Park sits beside Historic Route 66 and is 5 miles east of the small community of Ash Fork. This is a very pleasant place to camp in the Kaibab National Forest. The neatest geographic features here are Johnson Canyon and Johnson Crater to the north, Perrin Draw to the south (on the other side of I-40), and the mesa like peaks with exposed rock. Campground Directions: From Ash Fork take I-40 east about 5 ½ miles to exit 151 (Welch Interchange). After exiting turn left (north) on Forest Road 6 and drive a very short ways to the large meadow. 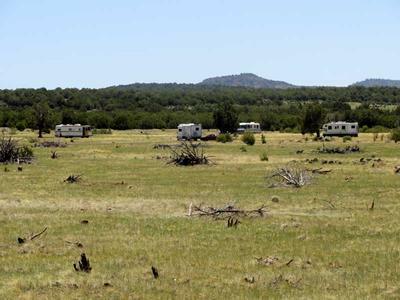 There are several good RV campsites here and there is plenty of room, even for big rigs. There are a few more campsites to be found further down FR 6. This is a lovely campsite and it’s very peaceful, considering how close it is to I-40. 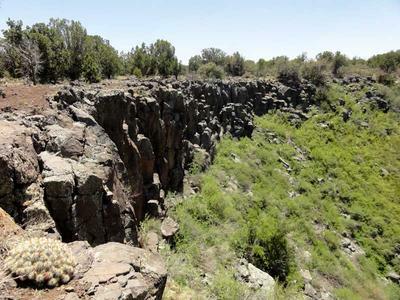 It’s situated on a meadow with a few juniper trees here and there. The forest outside the meadow is still open enough to make hiking easy – however, the jagged volcanic rocks covering the soil do make hiking a bit harder in places. It’s a good idea to bring a GPS or compass when hiking as the forest can sometimes be disorientating – simply because you often can’t see very far in front of you. Going to a high point for a better view helps. Recreation: The Ash Fork Hill Loop Bike Ride starts here. 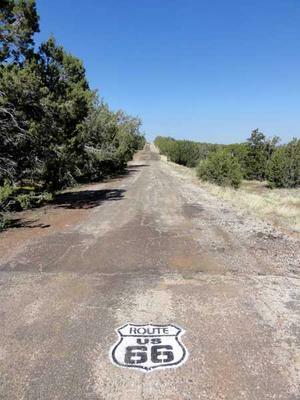 It’s a neat ride that follows Historic Route 66, which has seen better days. The pavement is mostly intact…but watch your speed as there are many rough spots with potholes and dips. Insects: Just a few large gnats/small flies. No problem though. There are many grasshoppers and caterpillars here. Wildlife: I saw 3 elk while hiking. I also saw several jack rabbits, a few squirrels, a mouse, ravens, turkey vultures, a few hummingbirds, and many other birds. It’s very easy to see tracks here, with the super soft loamy soil. I have seen countless animal tracks, mostly of elk, possibly deer too. From the deep tracks it looks as though things get extremely muddy when it does rain. Weather: It’s been very nice and sunny. Highs have been mostly in the 70s/low 80s, with a few days in the 60s when I first arrived. Lows have been in the 40s, and 50s for the last few days. It does get a bit windy here at times. I had gusts of around 30 mph for a few days. Thankfully it hasn’t blown the RV around much. Cell Signal: Verizon cell phone service is good. Verizon mobile broadband internet is not so fast here. It was fairly fast when I arrived, but for the last week it’s mostly been very slow. VZ Access Manager shows a fast connection of 70/68 at times, but it’s still slow. RV Park Rating: 8 out of 10. It’s just beautiful and peaceful! It would be a 9 if I-40 wasn’t so close. Better Verizon internet service would be nice too. This is a great area for viewing wildlife!